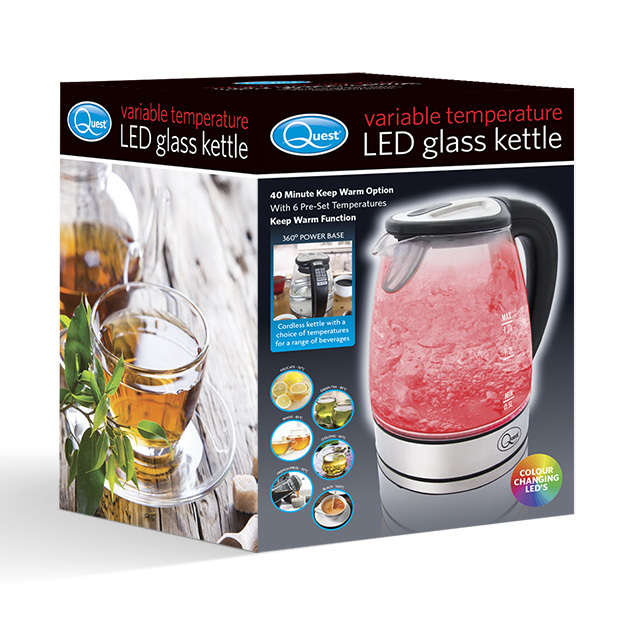 Stylish and easy to use, the Quest 1.7L LED Glass Kettle is an elegant solution to your water boiling needs. A stunning addition to any kitchen, the high quality and sleek design will allow you to finally enjoy the tea making ritual. This powerful 2000W Variable Temperature Glass LED Kettle with water indicator, push button lid and 360° cordless power base and 6 pre-set temperature setting for different beverages is perfect for making your favourite hot beverages!. A stunning addition to any home, the high quality and unusual design will allow you to finally enjoy the tea making ritual with 360° degrees powerbase and push button lid. Durable clear glass body with water level markings. Striking LED illumination when you have chosen from the 6 pre-set temperatures.